High precision meta-plastic composite parts are used in many automotive applications. "Such hybrids can for example be found in the steering controls of virtually all leading car makes and models. The manufacturing of such composite parts is one the core skills at Swoboda KG" explains the operations manager at the parent plant in Wiggensbach near Kempten. "Assemblies by Swoboda can be also found as interfaces between electronics and mechanics in gear controls, connectors, magnet and high voltage assemblies as well as numerous other car components. In daily use they provide the safe transfer of driver's commands to the reaction of the vehicles", adds the operations manager. In its production facilities the company from the Allgäu relies on the latest automation technology. In many of the testing stations image processing is a standard component for the quality control of the products. This also applies to the manufacturing of electromechanical steering controls for cars. These hybrid elements with plastic parts, metal conductor lines and bonded surfaces today form an integral part of the steering for modern vehicles. The entire production process for these complex components is extremely multi-faceted and requires a well thought out combination of various manufacturing and testing methods. All control elements in a car are extremely important functions: breakdown or reduced performance of steering support can lead to dangerous situations in traffic. For this reason all the components of such a functional assembly must be 100% fault-free. The quality control of these assemblies is a demanding task. 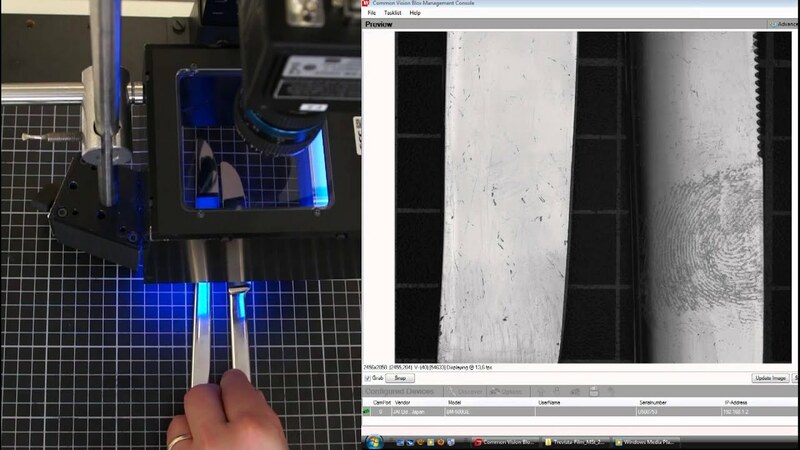 "The main challenge when testing these products consists of the differences between the material surfaces" as a Swoboda image processing specialist in the department of process technology outlines the task he faced in the realisation of the test station. "The optical variances in surface quality of the metal parts from matt to polished are difficult to analyze with a conventional image processing system due to the differing light reflections. This leads to increased pseudo-rejects and thus post-sorting and additional costs. With the trevista system which we have been using for some months now at this test station we are now in a position of being able to detect and analyse the surface quality at high resolution." In the words of the image processing expert, the reliability of fault detection was improved considerably: "The pseudo-rejects were reduced by nearly two thirds at an early stage. We still see potential for optimisation of the necessary detection of deflections and tilts on the bonded surfaces of the assemblies, but we are already looking for a suitable solution in close cooperation with STEMMER IMAGING." The equipment on which the steering control components are manufactured at Swoboda has been in operation since 2009. Initially the company engineers had realised the test station on the basis of a 2D image processing system which, however, resulted in increased pseudo-rejects. "This incorrect ejection of apparently defective components which, when checked manually, proved to be free of defects was something we wanted to minimise or, if possible, eliminate completely", was the way the Wiggensbach operation manager summarised the situation at the time. "We were therefore on the lookout for a suitable alternative system and came across a solution at the Control trade fair in May 2012" added one of the system developers for Swoboda image processing systems. Dr. Tobias Henzler of STEMMER IMAGING Sales with responsibility for image processing solutions and 3D technologies demonstrated the trevista system which is distributed by STEMMER IMAGING to Swoboda's expert for the first time. The first positive impressions gained at the fair were confirmed later on during further tests and intensive feasibility studies. The hybrid components of the steering control are fed to the trevista system and recorded there using the 12 megapixel camera Genie TS by Teledyne DALSA. The operations manager and the imaging expert at Swoboda KG together with Dr. Tobias Henzler (from left to right) in front of the trevista test station. In its application at Swoboda the trevista image processing system plays out its features to the full. The dome-shaped illumination equipment of the trevista system ensures optimum illumination of the test samples and keeps away interfering ambient light. In addition, the rugged design allows reliable integration into the manufacturing process or into an automatic tester. However, the speciality of this system is its patented Shape-from-Shading technology which is highly suited for the inspection of shiny or reflective surfaces, as is the case with the Swoboda hybrid assemblies. It allows problem-free inspection of not only shiny metallic components with varying surfaces but also of black plastic material. The clever idea behind the system and the difference compared to other dome illuminations is that test samples are illuminated with diffuse light from four different directions and a camera image is taken in each case. A special calculation algorithm processes these input images and creates four high value synthetic event images from them: the first two represent the local slope of the surface in x and y directions. The third, the so-called curvature image records the topography of the surface independently from the direction. The fourth image records the pure texture of the surface and can be compared to a conventional 2D image without irritating shine. It is thus possible to reliably distinguish topographic shape characteristics from brightness characteristics of the material or strains caused by lubricants and corroded areas. These four images are transmitted to the image processing system for automatic evaluation of faults. The calculation algorithm is computer-based and integrated into the software platforms Sherlock by Teledyne DALSA and Common Vision Blox (CVB) by STEMMER IMAGING. Using this combination even small fault characteristics of only a few micrometers depth can be made visible. "The curved images clearly show the surface's shape characteristics, thus making parameterisation of the image processing software easy and safe. This makes it possible to check defects which could have not been separated automatically hitherto. trevista can capture flat but also slightly curved surfaces with varying degrees of shine reliably" is the way Dr Henzler describes the strengths of the system. Area scan cameras are used as a matter of principle in the trevista system for inspecting non-moving assemblies. This is the constellation used in the Swoboda test cell. However, in case of inspecting jacket surfaces of rotationally symmetric components, a combination of line scan cameras also offers complete inspection. In this case, the timing of the illumination needs to be specially adapted to the characteristics of these cameras. "Following diverse application-specific adaptations we were able to integrate the test system into the equipment as soon as October 2012 in place of the present 2D system" adds the Swoboda image processing expert on the course of the project in the Wiggensbach works. "This rapid implementation was extremely helpful as our customer had specified a relatively tight time window for the production and testing of assemblies." In the words of the operations manager, the use of the new system has to date led to a considerable reduction in additional manual inspection. "We have the objective of completely dispensing with manual sight inspection as soon as the station has proven that it works reliably under constant operating conditions." Cycle times were not a problem. "We had sufficient leeway with the trevista system to comply with the cycle times of the upstream unit." The Swoboda employees rate the cooperation with STEMMER IMAGING as positive throughout: "We are very satisfied with this provider of image processing, especially the prompt support in case of problems. In our business, the automotive industry, this is crucial, we depend on very fast reaction times" confirms the Swoboda operations manager as to his choice of a suitable supplier. "The partnership with STEMMER IMAGING has meanwhile become a solid and dependable factor for our image processing systems." In the words of the responsible quality assurance team leader, one of the other advantages of working together with STEMMER IMAGING was "that we were able to obtain the individual solution we needed for our application. The standard system was able to technically solve the pure image processing task, but as the system had been added to the line at a later stage, some specific changes to the standard system proved necessary which we were able to achieve in the time available in close cooperation with STEMMER IMAGING and the manufacturer of the system." As examples he mentions the mechanical adaptation of the base plate of the trevista system and the linking to the existing software system. Another form of very useful support was the fact that STEMMER IMAGING loaned Swoboda KG the trevista system during the evaluation phase. "This way we were able to set up trevista initially as a stand-alone system and test whether the results were reproducible and plausible. We had the loaned components on site for several months and paid a fee for their use, which was then largely offset upon purchase." This was regarded by Swoboda KG as expedient: "We viewed the development as a joint project, with both sides investing. This way we were able to gain an advantage over other suppliers, which has now paid dividends." So far the system has met many expectations. For this reason Swoboda are now looking at further trevista stations for other applications and projects in production. Also very helpful for familiarisation with the new system was a day of individual training on the trevista system at STEMMER IMAGING in Puchheim, attended by the image processing specialist at Swoboda. "The training by Dr. Henzler and STEMMER IMAGING training manager Lars Fermum considerably speeded up the introduction to the system and definitely contributed to us being able to have the plant operational in the short space of time specified." Swoboda molding elements is a family-run company with worldwide operations employing a staff of over 1,400 employees and with a turnover of over € 200 million. The company develops and manufactures high precision metal-plastic components for automotive electronics. Core products include electromechanical assemblies such as housings for gear controls, sensors, steering controls, magnet assemblies as well as plug connectors. With its know-how and specialised production, Swoboda is one of the leading companies in the field of metal-plastic composites. Swoboda manufactures at locations in Wiggensbach and Kempten (Allgäu), the Czech Republic, Romania, USA and China.